Fujitsu Electronics Europe has introduced the newly developed automotive FRAM device MB85RS64VY which is optimised for the automotive sector. This is the third product of the company’s new automotive FRAM family, following the release of two models with 256Kbit and 128Kbit. It provides a temperature range up to 125C and includes a memory of 64Kbit as well as an SPI interface with a maximum operating frequency of 33MHz. Supported with AEC-Q100 qualifications and documentations, the device is aimed at the automotive market as well as industrial automation applications, which needs robust and fast non-volatile memory products in hot environments. The operating voltage of the device ranges from 2.7V to 5.5V. 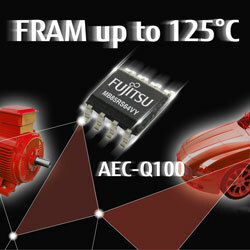 This relatively small FRAM product provides a cost-effective alternative to other members of the automotive FRAM family. It comes along in two package versions: SOP-8 (for the automotive and industrial market) and SON-8 package (for the industrial market), the later one measuring as small as 2mm x 3mm.